The Los Angeles Dodgers could be ready for a little Magic. LOS ANGELES (AP) — The Los Angeles Dodgers could be ready for a little Magic. 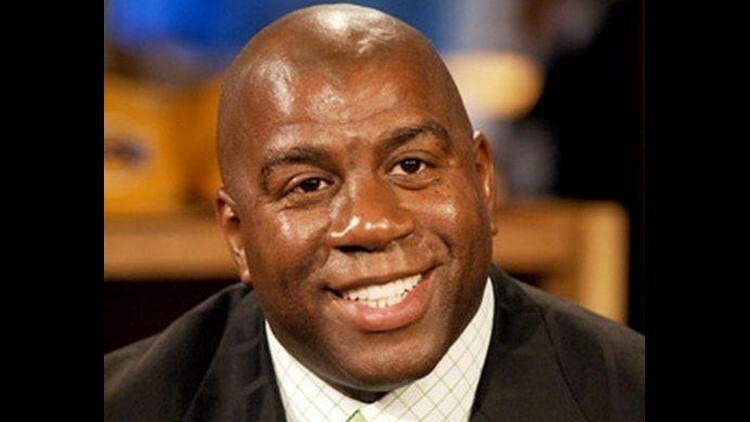 Magic Johnson has joined a group bidding to buy the beleaguered Dodgers, hoping to restore the luster of a once-glamorous franchise that has been sullied during owner Frank McCourt's messy tenure. Johnson, the longtime Los Angeles Lakers superstar and former part-owner of the NBA club, is partnering with former Atlanta Braves executive Stan Kasten and wealthy investor Mark Walter in the upcoming auction for the Dodgers, who filed for bankruptcy protection in June. McCourt finally agreed last month to auction the team at an undetermined future date. "I'm excited to have the opportunity to be part of the Dodgers legacy & bring a World Series championship back to LA," Johnson tweeted Friday. Johnson has joined a heavyweight group in what's expected to be a tough competition for the Dodgers: Kasten is the former president of the Braves and Washington Nationals, while Walter is the CEO of a global financial services firm managing more than $125 billion in assets. Their organization will be called Guggenheim Baseball Management, and Walter's vast financial resources could put the group up front in the bidding. The Los Angeles Times first reported Johnson's interest in the Dodgers. The news was greeted with enthusiasm across Los Angeles from fans who count Magic among the most popular athletes in Southern California sports history. The three-time NBA Most Valuable Player has become a successful businessman since his second retirement in 1996, with investments in several sectors of commercial real estate. But Johnson's passion still is sports, and he has spent several years looking for an ownership role in a pro franchise, most recently expressing his interest in returning the NFL to Los Angeles. Johnson amicably left his ownership position with the Lakers in October 2010, selling his 4.5 percent equity stake to Dr. Patrick Soon-Shiong in what's widely thought to be a wildly lucrative transaction for the former Lakers point guard. The Lakers would love to see Johnson with a large ownership role in the Dodgers. Lakers general manager Mitch Kupchak regularly speaks with Johnson, who has said he'll never leave his influential role behind the scenes with the Lakers and the Buss family. "I know he's sitting on a pile of cash, which is maybe why I take his calls as often as I do," Kupchak said Friday. "He's been incredibly supportive as an owner. Never once did he say, 'Mitch, this is what you should do.' He would be a great owner (of the Dodgers)." Johnson played baseball growing up in Michigan, where he rooted for the Detroit Tigers. The full list of bidders for the Dodgers is still unclear, but it will be studded with accomplished businessmen and famous athletes who realize a cash machine is sitting up in Chavez Ravine for the proper ownership. Former Dodgers owner Peter O'Malley is in the mix, and Dallas Mavericks owner Mark Cuban has said he's investigating the prospect. Former Dodgers Steve Garvey and Orel Hershiser have been vocal about pursuing the club, while former Dodgers general manager Fred Claire, Los Angeles developer Rick Caruso, supermarket mogul Ron Burkle and former Buffalo Sabres owner Tom Golisano have been linked to the bidding. The price likely will break the record for a baseball franchise, topping the $845 million paid by the Ricketts family for the Chicago Cubs in 2009.